Your Dentist Makes the Dental Implants in Harrisburg Process Simple! Have you been living for some time without a complete set of teeth? Are you tired of not enjoying life to the fullest because of your missing ivories? If so, then your local dentist is weighing in to inform you about the procedure that is considered the gold standard for tooth restoration – dental implants in Harrisburg. As you continue reading, you’ll become familiar with the different steps necessary to allow you to regain the full function of your teeth and get the smile of your dreams. Dental implants are surgically inserted titanium posts that are affixed to your underlying jaw bone and act as replacements to your missing teeth roots. Titanium is the preferred material of choice because of its biocompatibility, meaning that it typically won’t be recognized as foreign to the human body. This allows it to fuse with your existing bone material. The process for getting them is very simple. Initial Consultation – Before any work is done, you will visit your dentist so that he can take X-Rays to determine whether you have enough healthy bone mass to support a dental implant. Then, the two of you will discuss the different options that are available and settle on a treatment plan. Dental Implant Placement – The next visit will be to have your dental implant placed. The process begins with you receiving either local anesthesia or IV sedation to make the procedure as comfortable as possible. Next, your dentist will insert the implant beneath your gums and into your jawbone. Osseointegration – After the surgery is done, you may notice some swelling, bruising and minor bleeding, but these are all normal occurrences that can be managed with over-the-counter medications. 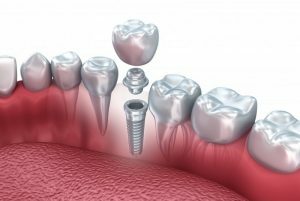 Also, as part of the healing process, you will undergo what’s called osseointegration, which means that your natural bone will fuse with the dental implant. Abutment Placement – After the fusing and sufficiently progressed, you will return to your dentist to have an abutment placed. This is a connecting anchor between the implant and permanent fixtures like crowns or bridges. The former is used when there is a single tooth missing and the latter to replace two or more in a series. Permanent Teeth Placement – The next step in the process is to have your permanent fixture placed. This only happens after there has been sufficient time for your gums to heal. The process of fabricating your new crown or bridge begins with your dentist taking bite impressions of your mouth that will be used to make highly-customized, precision fixtures. When they are ready, you’ll be fitted, leaving you with a fully restored smile! Check-ups – After your procedure is done, your dentist will want to see you at least semi-annually for preventive care and to monitor your implant. There’s no need to continue living in shame and regret, because the dental implant method provides an avenue to fully restore the way of life you deserve to have. To learn more about the process, reach out to your dentist in Harrisburg to schedule an appointment today! A graduate of the NYU College of Dentistry, Dr. Gary M. Klein offers comprehensive and expert care at Klein Family Dentistry. You can learn more about how he uses experience, compassion and the latest technological advancements to restore smiles through his website. Comments Off on Your Dentist Makes the Dental Implants in Harrisburg Process Simple!